When is the best time of year to build your new Chicagoland deck or porch? Would you be surprised if we said fall or even winter? Read why. At Archadeck of Chicagoland, we’ve been building outdoor spaces for over 25 years. It’s safe to say we’ve built in every weather condition you can possibly imagine. When asked about the best time to build a project, you might be surprised to hear our answer. Of course, here in the Chicago area, there are times throughout the year when weather conditions prohibit us from doing some building activities such as digging footings if the ground is too cold. But, you’d be surprised to learn that we are building throughout a good portion of the entire year. As you can imagine, many homeowners feel that the ideal time of year to have their new outdoor space built is in the spring or early summer. Homeowners often tell us that they waited and possibly saved for years before commissioning us to build their project. Because of that, they’re excited and don’t want to miss another summer without their new space. We totally understand but this presents a couple challenges. Spring and summer are our busiest months of the year and as you can imagine, we begin building new projects on a first-come, first-served basis. So, the homeowners that commissioned their new space back in January have their projects built before contracts that close in February or later months. As the season progresses and it becomes really busy, we have an increased wait time before we can begin the project as all reputable builders do. In fact, if a builder tells you they can start next week or even the week after, you may want to strongly reconsider that decision. You can’t afford to make your builder decision based on who is available to start the soonest. It’s not uncommon for a sought-after builder to have a wait time of a couple months, but it’s worth the wait. With Archadeck of Chicagoland, it may pay to wait! We’re homeowners too. We’ve waited for the right builder before making home improvements to our own homes. We know it’s not fun to wait so we want to do something about it. 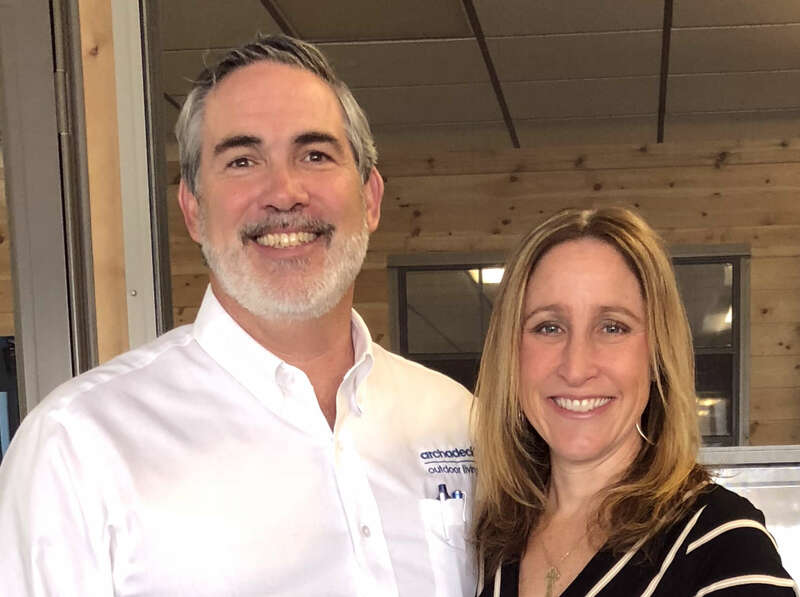 At certain times of the year, we offer a flexible build discount to homeowners that are willing to schedule their project build times a little later in the year. During your consultation, we can give you an idea of when that time frame is. We appreciate your patience so much that we are willing to take 10% off the price of your carpentry project! Of course, this discount must be noted on your contract and cannot be added on top of another discount but we want to thank you for your patience in choosing Archadeck. As you can imagine, when facing the challenge of a wait time before starting a project, some homeowners decide to postpone adding their new space until the next year. Unless they call super early the next year, they may run into the same problem. Even more importantly, we never know when spring is going to start. We could have fabulous weather in March. If you chose the flexible build discount and had your project built later in the previous year, your new space would be ready the very first day that spring appears. So often, our customers tell us how they wouldn’t have had that big family event at home if they didn’t have a space that’s befitting of entertaining and hosting. Your new outdoor space will be your favorite relaxing and entertaining spot at your house. When considering whether to hold off until the next year, think of all the years and all the events you will host, enjoy and remember on your new outdoor living space. Manufacturers have price increases, typically at least once per year. We never receive alerts of when these will be. If you push your project to the next year, the cost could likely be higher because of the price of framing lumber or because of the increased cost of other materials. 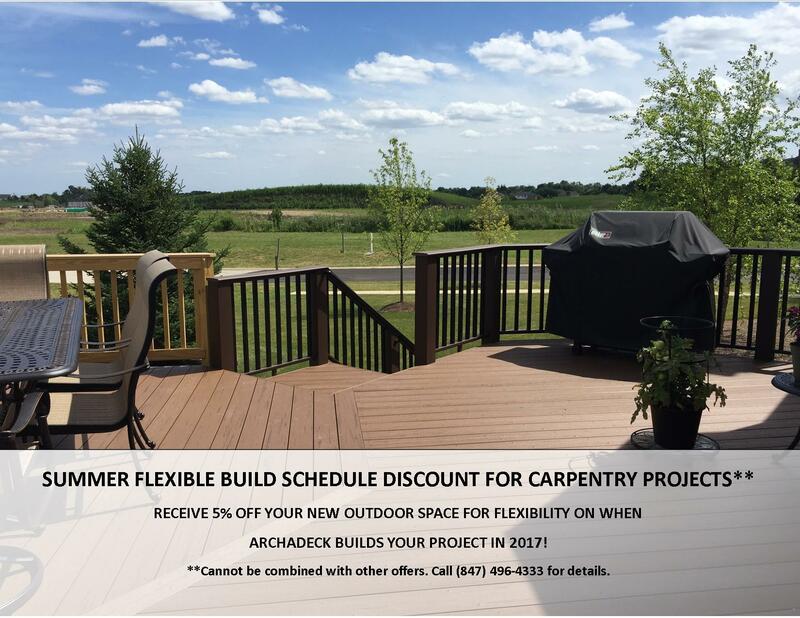 Give us a call now to take advantage of the flexible build discount of 5% off your entire build (carpentry projects only) ! Right now we are only offering this discount in August 2017. If you read this blog after August of 2017, ask your design consultant to see if the flexible build discount is still being offered.